The No. 8 Ryerson Rams defeated the No. 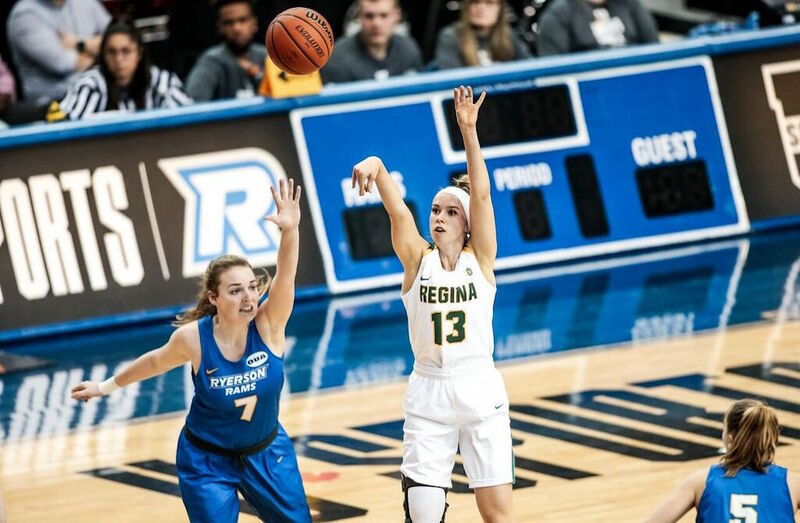 5 Regina Cougars 63-45 on Friday night to advance to the U SPORTS Women’s Basketball Consolation Finals. The Rams opened the scoring by getting deep in the zone and finding the rim. The Cougars managed to get past the Rams enough to minimize the gap, yet at the end of the first quarter the Rams were up 14-8. The Cougars were finding the outside to capitalize on each opening off the top of the second quarter, but it quickly turned into a battle under the net in each zone. The Cougars continued to battle, but the Rams anticipated each movement to lead 22-17 halfway through the quarter. The Rams maintained a strong defence, and even when the Cougars did get by, the Rams made quick tactical movements to negate their opportunities. At the end of the quarter, the Rams led 26-22. Ryerson came out to start the third moving the ball well and grabbing rebounds. Their communication on the court helped them take chances, while still able to recover from the Cougars’ blocking game. Ryerson held a 16-point lead at 50-34 at the end of the third quarter. Into the fourth, the Cougars searched for their final push. They fended off the Rams in their zone, and took chances in transition. Regina accelerated down the court and had a number of chances, but the rim got the best of them. Christina McCusker moved the ball well for the Cougars and finished with a team-high 19 points. “I’m happy that we gave it all that we had in this last game, we faced so much adversity this week and that’s sports. We gave it everything we could and that’s all we could ask for in that last game,” said McCusker. All the while, the Rams took charge of the court and led 55-38 halfway through the final frame. Sofia Paska controlled the ball and was able to find the basket from within the arc and from three. “She’s a great shooter, we’ve known that her whole career. 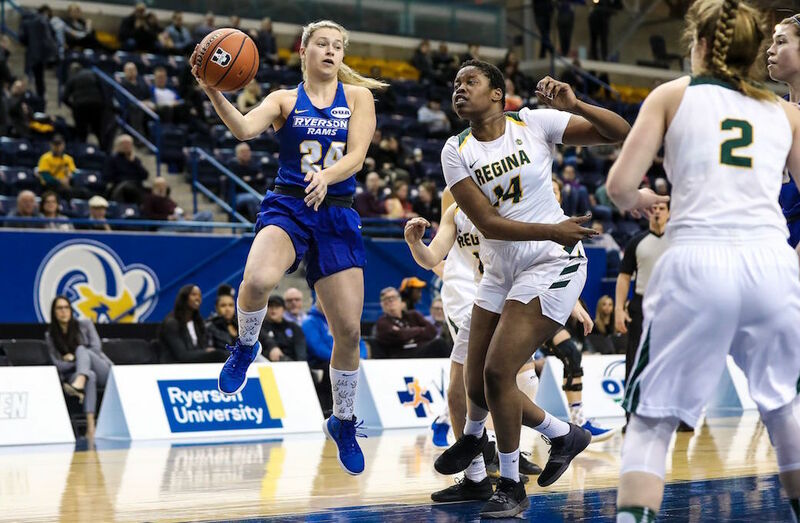 She’s hit a few threes, and I mean she got herself to the foul line nine times and I think that, for me, is more exciting,” said Ryerson head coach Carly Clarke. 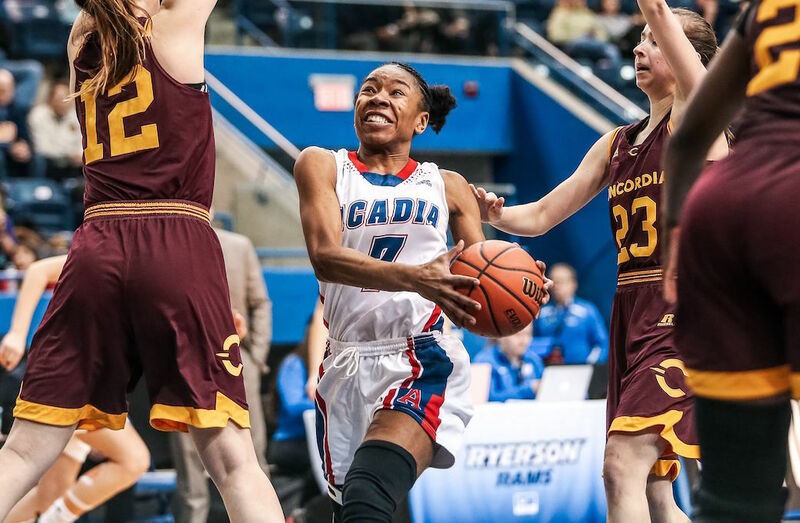 The Rams will face the Acadia Axewomen in the consolation final on Sunday at 1 p.m. ET / 10 a.m. PT.